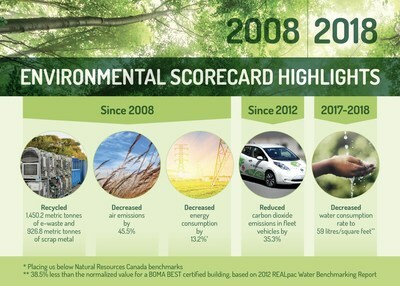 OTTAWA, Nov. 5, 2018 /CNW/ - CBC/Radio-Canada shared its new Environmental Performance Report, which highlights the public broadcaster's "green" scorecard and initiatives from April 2017 to March 2018. The latest edition also marks the 10th anniversary of CBC/Radio-Canada environmental reporting. Reduced carbon dioxide emissions in fleet vehicles by 35.3%, the equivalent to 1,164 passenger vehicles driven for one year. Our report is available online at: cbc.radio-canada.ca/green. "Ten years of proactive environmental performance reporting is a significant milestone," said Catherine Tait, CBC/Radio-Canada's President & CEO. "We've come a long way, launching a number of innovative initiatives, many of which have expanded across the country. 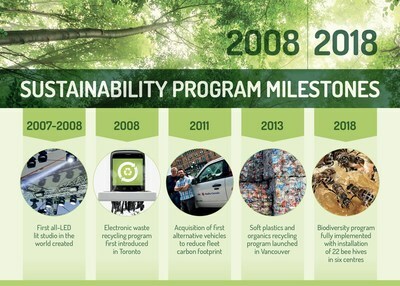 Being sustainable is part of our commitment to being a modern public broadcaster. Based on the results achieved to date, I'm confident we can continue working in ways that help minimize our impact on the environment and aid in ensuring a better world for future generations." CBC/Radio-Canada is Canada's national public broadcaster. Through our mandate to inform, enlighten and entertain, we play a central role in strengthening Canadian culture. As Canada's trusted news source, we offer a uniquely Canadian perspective on news, current affairs and world affairs. Our distinctively homegrown entertainment programming draws audiences from across the country. Deeply rooted in communities, CBC/Radio-Canada offers diverse content in English, French and eight Indigenous languages. We are leading the transformation to meet the needs of Canadians in a digital world.